The MAAX corner glass shelf is a storage solution that you'll find as pleasing to the eyes as it is convenient to your reach. Installs with Utile shower wall panels and regular ceramic tile or as a decor shelf in any corner of your home. The shelf features a curved shape and small brackets for a contemporary look that will mesh with many decors. A luxurious, cherry-wood medicine cabinet with antique brass knobs and a reversible door. 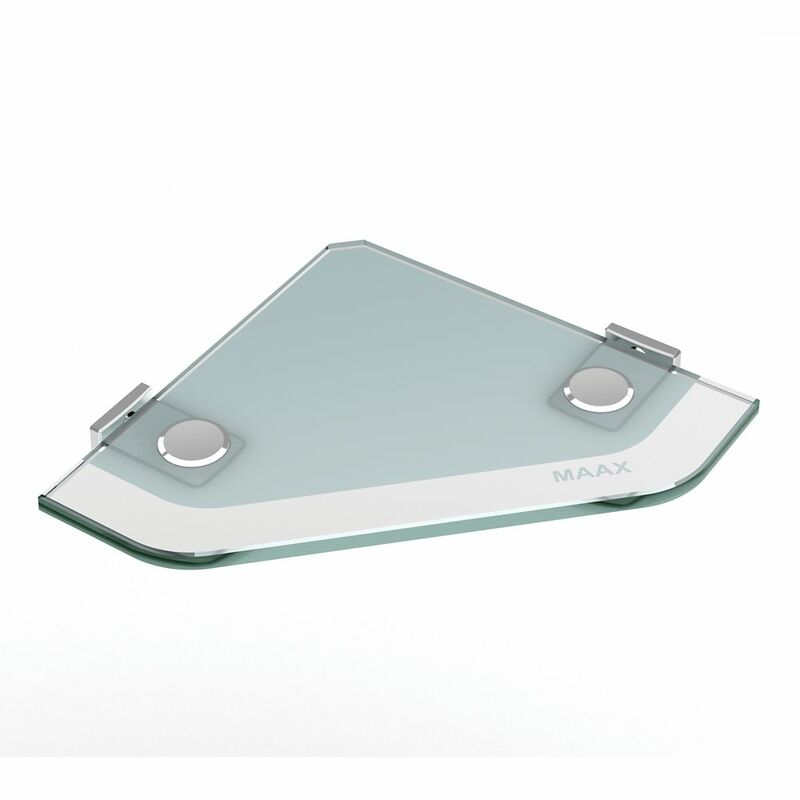 Features highly quality premium glass with beveled edges. It measures 12 in. across, 6 in. from back to front, and 36 in. from top to bottom. Comes coated in a sensuous coffee finish. Timeless yet trendy, the Classic Collection of bathroom vanities, storage cabinets and mirrors from Cutler Kitchen and Bath is a perfect compliment to any bathroom. Medicine cabinets are available in 5 matching vanity colours and door styles, doors are fitted with brushed chrome handles and European soft closing hardware. Cabinets are supplied with adjustable shelves. This stunning LUKX Casey Medicine Cabinet is the perfect combination of functional storage and simplistic, transitional design. This cabinet was created to complement both, traditional and modern spaces with its' rustic yet elegant finish. It features matching interior, dimmable LED light and open shelf for a unique and contemporary look. Corner Glass Shelf The MAAX corner glass shelf is a storage solution that you'll find as pleasing to the eyes as it is convenient to your reach. Installs with Utile shower wall panels and regular ceramic tile or as a decor shelf in any corner of your home. The shelf features a curved shape and small brackets for a contemporary look that will mesh with many decors. Corner Glass Shelf is rated 4.6 out of 5 by 5. Rated 5 out of 5 by Ron from Easy to install if you have the correct tools. This... Easy to install if you have the correct tools. This matches our MAXX shower door. Looks great ! Rated 5 out of 5 by Maximus from Good product great customer service Purchased 2 for my shower. Installation was straightforward though not easy drilling through travertine. One shelf had a bad part contacted MAAX and the sent me another shelf complete with hardware. Can't beat that. Rated 4 out of 5 by Wayne N from Some knowledge needed We bought two shower shelves. Each shelf requires two holes to be drilled through the wall, be it tile, marble or otherwise. These holes do not always line up with the grout line and can be difficult when drilling through extremely hard material such as porcelain. It is also difficult to keep the holes exactly level as the drill bit "dances" around when first starting the hole. This unit was purchased in place of another unit that uses sticky tape and silicone to adhere their shelf to the wall. Maax's instructions told me that the holes were located 6 inches from the corner so that I could put a stud in place and then tiled the wall. The tiles plus adhesive created more distance making it closer to 7 inches from the corner. Needless to say, my stud has not helped. I would put the stud sideways for the next time making it easier to screw into part of the stud. We do like that there is a spillway at both edges and corner of each shelf making it easier to keep the shelf clear of water. The description says easy to install. How does one install them? Glue?